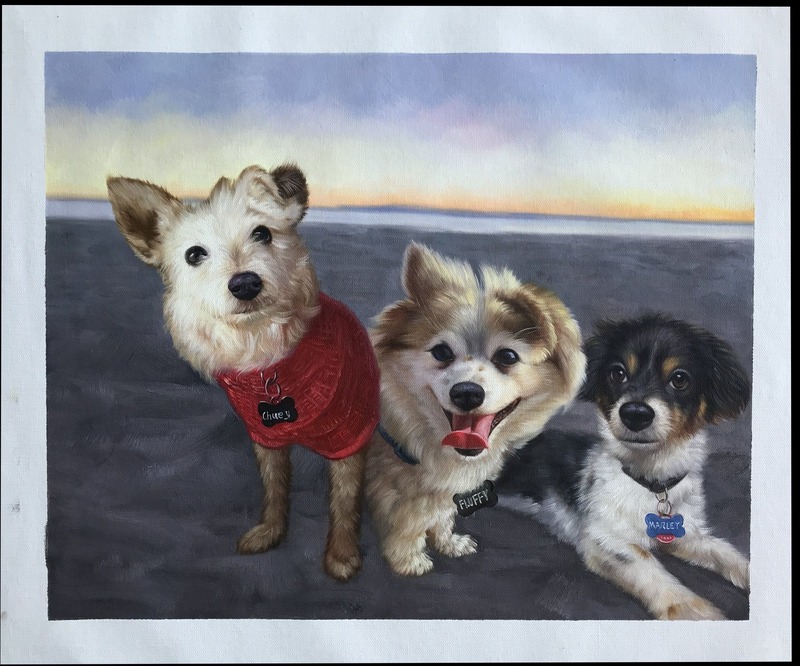 Would like all 3 dogs in one painting. Chuey(dog wearing red sweater), I would like him to be wearing his same red sweater in the painting. Fluffy(beige and white dog with his tongue out) I would like him panting and having his tongue out in the painting. Marley(black and white dog), I would like him just to have the same facial expression as he has in the picture and the same puppy dog eyes he is giving. I would like the order to be (left to right) Chuey, Fluffy, then Marley. Also, chuey is the biggest, fluffy is the mid sized and marley is the smallest. I added a picture of all 3 of them standing together for size reference. Please replace background and use a beach sunset, would prefer sand on the bottom, ocean, then the sunset. (basically the same background as sunset and beach picture with Chuey in it). Please ask any questions if needed!